The peonies were late to bloom this year, but they've been glorious. I am enjoying them all around the house, sharing them with friends, and while sitting in the garden reading. I love having plants that allow me to beautify our home, both inside and out. Don't you? ps - I am not receiving any comments in my email, so I will be responding to your comments in the comments! I found a treasure when I was out shopping with Cheryl on Saturday. In fact Tim spotted it and pointed it out to me. It is the most lovely tea cup with strawberries and flowers, on the most delightful shaped cup! 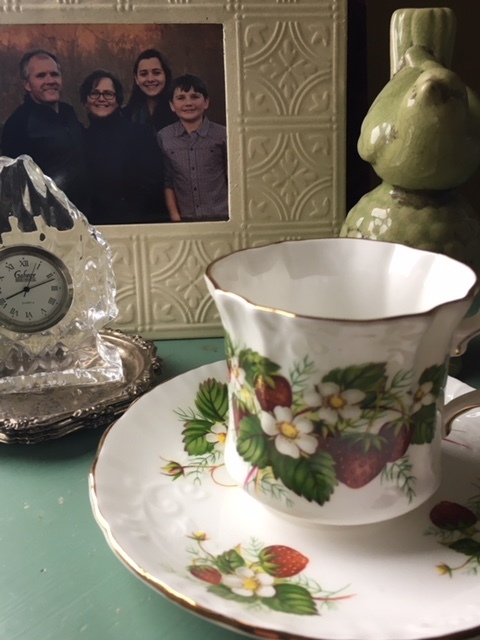 I like to collect unique teacups and this one with its lovely shape and beautiful strawberries fills the unique category perfectly! Joining Tuesday Cuppa Tea and Bernideen! Also if you live in the EU could you let me know if the notice regarding cookies and data collection is showing on my blog? Thanks! I'm going to share some photos with you and see if you can guess who I got to visit with on Saturday! If you guessed Cheryl from Thinking About Home, you'd be correct! We had a great day! Tim and I had a three hour drive to their home, and we do love a road trip together! Cheryl and I planned a tour of The Pineapple House, (which two years after their move from the Farmhouse, I still hadn't seen!) and a catch up visit. Then we went out for lunch and some shopping. We've shopped together when they come to Lancaster, but I'd never gotten to go to some of their favorite places to shop in their home area. 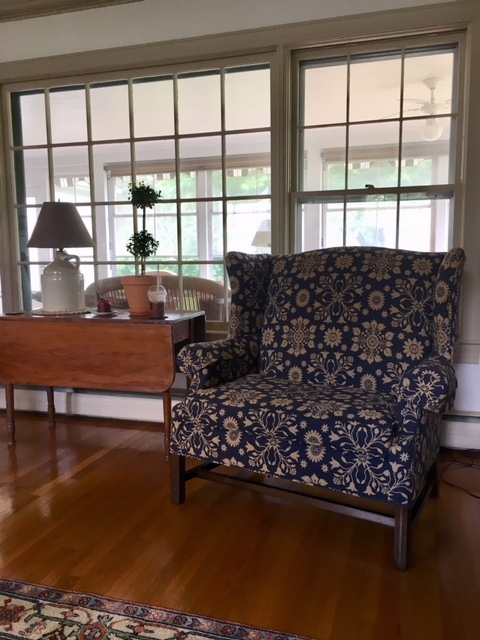 We had a lovely lunch at a cafe, then went to a used bookstore and then an antique store. I found books for myself and Sarah, and then I found a great teacup at the antique store! I'm sharing that tomorrow. Yesterday, I took the kids (Kyle, the grands, and a friend) to the library. Kyle found what he wanted, I found a few books to read, the girls played in the very nice playroom, while the boys played chess. I always check out the library used bookstore. Yesterday, I found treasure! Four books about Tasha Tudor for $4.00 a book! Funny thing is that one of the books I had checked out was Tasha's Garden. Needless to say, I returned it since I now own my own copy! Tasha was an interesting person. She made the life she wanted, and said she considered her art as commercial art, since she made her living from it. Her biggest love was her garden, home, and animals. Are you a fan of Tasha's art? Yesterday, I found out that a dear friend that I met through blogging, had died. Julie's blog was called, Eyes of Wonder. Jewels was a light for so many of us. Encouraging a love for family, for the Lord, of having a heart to serve both. She was a woman who could see beauty in the ordinary, and help you to see it, too. Over the years, I have become friends with many of her kids on social media, and my heart is breaking for them and for Julie's husband George. I'm praying for her family, that they will see God is with them in this hard, hard thing. I'm thankful to have 'known' Julie in even a small way. She was inspirational and desired to share her deep heart for the Lord and her family with us all. She's now with her beloved Savior, and I'm grateful that one day, I'll get to hug her and tell her thank you in person. Here near the end of May, the peonies are finally in bloom! I love growing things in my garden that bring beauty to my home! Do you find that when you have something big going on, that other things fall to the wayside? Yesterday, I had to go for groceries, and while I was gone, Kyle mowed and Sarah did a deeper cleaning in the bathrooms. Today, I have to go to the laundry mat and wash 25 tablecloths, dry and fold them, and repack them into the plastic lidded tubs. Then we really should do some weedding in the cottage garden, and I need to finish painting the lower cupboards in the kitchen. With our open floorplan, when the grands are here, I cannot do things like paint. This is the only day this week that they will not be here, so the painting must get done. If I can, I'll do the upper cabinets today, too. We've finished school for the year, so I need to prepare all our paperwork and get next years information along with this years evaluations turned in to the school district. There was an amazing wedding on Saturday. A beautiful bride and and a handsome groom committing themselves to one another. The groom's sisters getting their hair done. A good portion of my job on wedding day, before the wedding, was to problem solve, curl the mother of the brides hair, and to wrangle bridesmaids, who were here, there, and everywhere. Little things happen to mess up a wedding day timeline, such as some family running late, needing help with hair, and rain. Lots of rain. The rain changed the plan from photos at a park, but we did get a break in the rain and the photographer was able to take the bride and bridesmaids outside for some photos. I can't wait to see those. We actually started on time, too! Yesterday was spent assembling wedding bouquets, boutonniers, and corsages. Sigh...I LOVE flowers, but especially wedding flowers. I always keep all the little bits and pieces of flowers that get clipped off, or the stem breaks. We use them for boutonniers and they work very well. The bride, her mother, sister, and grandma came over to help. We had a really good time together. These flowers are for her tossing bouquet. More photos to come. Setting tables, decorating the sanctuary, rehearsal, dinner. Then home this evening. Tomorrow starts at 9:00 at the church, as the bridal party prepares for photos (bride and groom separately with their supporters as they don't want to see each other before the wedding), wedding, more photos, appetizers during the photo time, dinner and dancing. Sending the newlyweds on their way, then cleaning it all up. Are You Watching Little Women? We watched the first episode yesterday on pbs.org. I like it, but somethings were surprising. Take Marmee, for instance. She's brusk in her tone, a lot, and she tells the girls in one scene to that the girls had "five minutes to get out of the house, to school and work." It sounded so much like what a modern mother would say. I did like the scene where Jo and Marmee are talking about Jo's temper and Marmee confesses that she has learned to control her own temper, but hasn't mastered her temper. Her behavior, in the scene where Meg has sprained her ankle at the party and John Brook and Laurie help Meg into the house, was so ungracious that she scared poor Laurie and Mr. Brook out of the house! I like the cast, even if I don't like the way Marmee is written. I am looking forward to watching the rest of the episodes as they come out. We got exciting news yesterday! Rachel has been awarded an educational scholarship from Chick-fil-A! As you can see seven other employees received them as well. 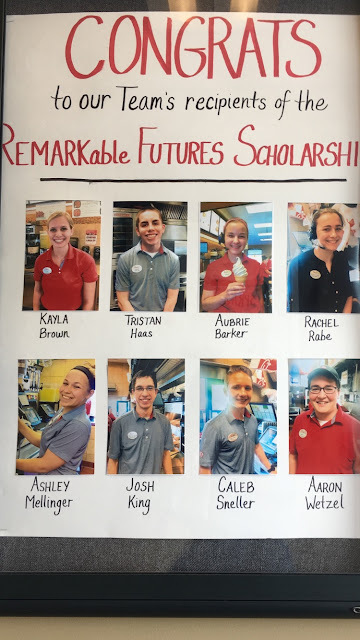 The other Chick-fil-A in our area is operated by the same couple and they had eight student scholarships at that restaurant, too! Lindsay's sister in law, Laura, received one! Chick-fil-A as a corporation has given out $14.5 million dollars worth of scholarships this year. Since 1973 they have given $60.5 million dollars in scholarships! They are very committed to their employees futures. You can read about their Remarkable Futures Scholarships here. This weekend was busy but fun. On Saturday, we planted the two David Austin roses I purchased last week, and the red quince I bought the week before. While planting the quince, I noticed some Honeysuckle growing next to a Viburnum along the creek. We clipped some to bring in. I also clipped some of my Bridal Veil Spirea. Its fun that it is in bloom this week. The wedding I am coordinating is this coming Saturday! We've had heavy rains and thunderstorms so I am not sure the blooms on this plant will last long. I'm glad I clipped some while I could! We had everyone over for Mother's Day yesterday. We bought steaks from Costco and marinated them for 24 hours. We broiled them in the oven, and they were the best! I found this helpful guide to cook times here, and a delicious marinade here.